With Spring weather here it was time for a spring sewing project. 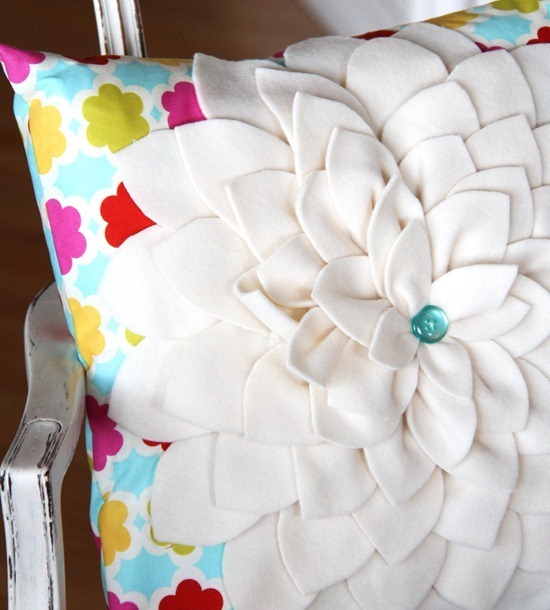 This was made the same way as my first Petal Pillow, but with white fleece instead of felt and pointed petals. I can’t remember the name of the pillow fabric but it would be cute in a girls room. This pillow is super soft since the petals are fleece…so I can lay on it and it won’t leave me with red scratchy face like the felt version does. Looks pretty! I think the fabric is Taza, but I'm not positive. I bet it is comfortable to lay on! Looks beautiful and inviting. very pretty and i love the button! Adorable! I was just thinking of making some more of these & the fleece is a lovely idea! Thank you so much for another great idea! Lovely. I clicked on your link and was so happy to see your tutorial – definitely adding this to my want to make list! What a difference a simple change of fabric can make! This looks completely different from the other pillow. I love it! The cute button in the middle is the perfect touch. It's just so darn cute. That's all there is to it! It's so gorgeous but that white fleece would get so dirty in my house! The fabric is Kumari Gardens by Dena Designs (the same designer as Taza). I love it. I've been following your tutorials and I made the felt version of it. I cut out the sprocket pillow last night. I'm so glad I found out about this blog! this is very pretty. i like how the petals sofen the whole look. I do love this pillow much! That pillow is gorgeous! That is on my list of things to do too!!! It is really fantstatic. Beautiful and looks soft. What a lovely cuddly pillow! I've been reading and loving your blog for quite awhile, just never posted. Love, love this pillow! I have four great nieces (Yes, all ;n one family! My nephew's girls–1, 3, 5, & 7 years) I guess I'm a tad slow-witted — it just this morning occurred to me what "cluck, cluck, sew" means (I think) Is it because you are a mother (hen) and because of what you do (sew)? Oh, woman, this is too pretty! I am definitely making one. The fleece idea is great! Have an awesome, creative week! Thanks for sharing! Another item for my to do list! 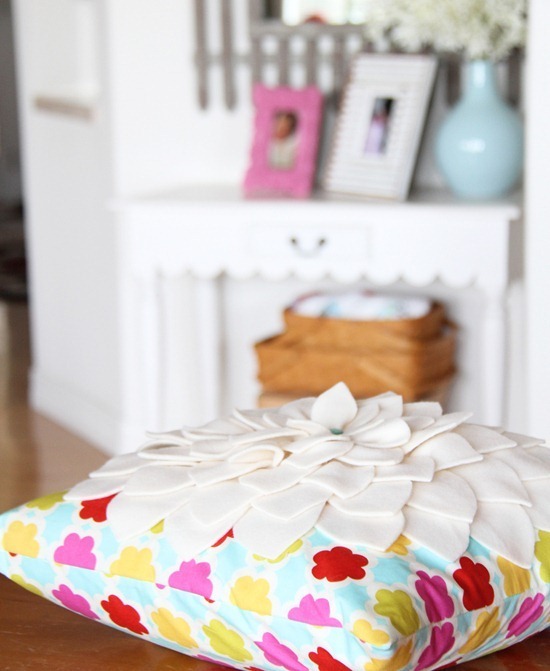 Love the idea of softer fabrics…more kid friendly! So very cute! and I have some fleece just waiting to be used! I love this pillow! I know this is really bad on my part but could you give the details on the petal shapes for those of us that are drawing challenged? What a fun idea; I love this! Okay……I'm going to be super dense and ask this question, only because I'm setting aside my pride since I'm in love with that pillow and want one just like it! 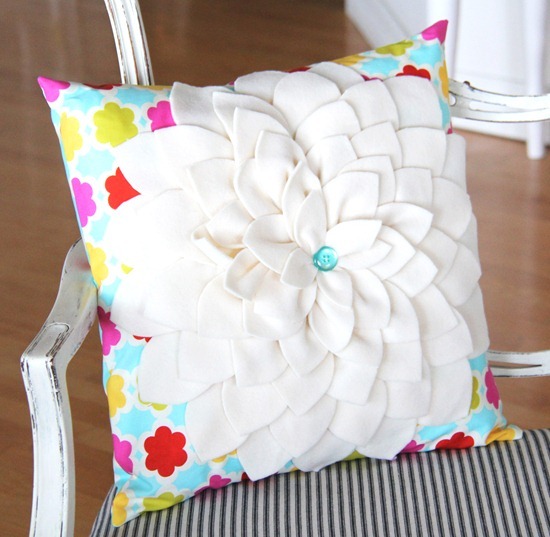 What did the shape of those petals look like before you sewed them to the pillow? Flat on the bottom and pointed on top? Did you free hand that design? LOVE the look of the white fleece!! what a very lovely pilow. That is GORGEOUS!! I love it! I couldn't believe it, today I walked into my local fabric shop. When I say local I mean small town, owner just started caring major quilting fabric and has around 100 bolts in the store, small. And there on a table was a pattern, your pattern, with your "name" cluck cluck sew. I couldn't believe it and I even mentioned it to the store owner (that is how small it is, she was the only one working) I said "I follow her blog!". That pillow is sooooo gorgeous! I LOVE the fleece idea! I happen to have some onhand and may try a mini version with mine. So charming!!! That pillow looks like it came out of a magazine! How long did that take to make and put together ? I just started using fleece fabric in my projects but I have only made blankets, coats for my dogs, and normal looking pillows.I am inspired to make sunflower fleece pillows for my patio before the summer starts now, and maybe a throw blanket to match it. Fleece was a great idea!